The APMM is designed to measure suspension kinematics and compliances by applying vertical or horizontal inputs to the suspension system of a vehicle. 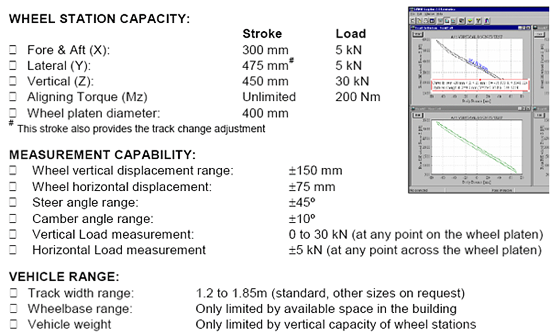 It applies loads or displacements to the wheels at low velocity, and measures the pseudo-static characteristics. The APMM is designed to be a cost-effective machine that can be used to test a wide range of vehicles. The APMM is also capable of performing detailed steering system tests using the optional steering wheel drive motor.